When it comes for high-performance sports wristwatches, Tissot is in touch with today’s active lifestyles for both men and women. The brand offers an extensive array of sports models for everyone from racing car drivers and hiking adventurists to deep-sea divers and yachting enthusiasts. What’s more, Tissot is deeply involved in numerous international sports competitions around the globe. It currently serves as the official time-keeper for the National Basketball Association in the United States, the international Moto Grand Prix, the Tour de France annual bicycling event, ILHF European Ice Hockey championships and the UCI international cycling competition. 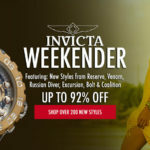 Action packed Tissot watches for men and women are spotlighted at WorldofWatches.com this week with our Tissot New Arrivals Event. Over 45 of today’s most sought-after Tissot models are featured, including styles from the popular T-Navigator, Courturier, T-Touch, PRS 516, Heritage, PRC 200 and T-Sport collections. Moto GP fans can capture the exhilaration of legendary driver Tom Luthi’s riding exploits on their wrist with the Tissot Tom Luthi Limited-Edition GMT Chronograph. 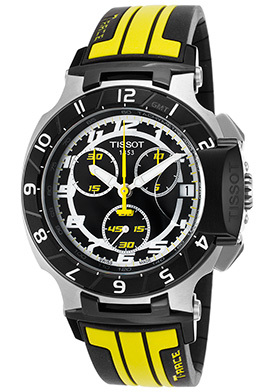 This high-speed and adventurous Swiss-made men’s watch is both vibrant and dynamic with a robust cushion-shaped case in premium grade stainless steel, presented on high-performance black rubber strap with bright yellow, contrasting racing striped detail and a push-button clasp closure for added convenience and security. The unidirectional rotating black ion-plated stainless steel bezel with white screened markers surrounds the highly-detailed dial with a black background, three sub-dials with white hands and luminous yellow markers, a yellow GMT hand, white luminous hands and Arabic numeral hour markers. Features include 1/10th of a second, small-second and 30-minute registers. 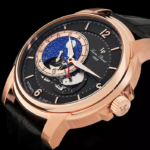 Additional features include a scratch-resistant sapphire crystal above the dial, premium Swiss-made quartz movement inside and water-resistance to 100 meters or 330 feet. 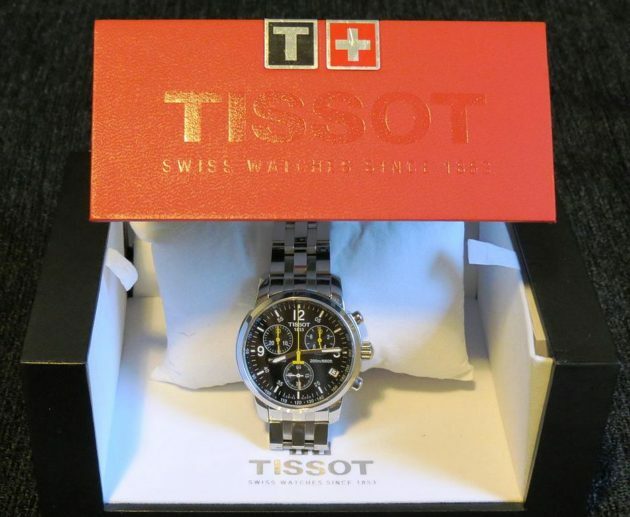 Tissot Tom Luthi Limited-Edition GMT Chronograph is 41mm wide and 13mm thick. Professional divers are certain to appreciate the rugged and ultra-durable characteristics of the Tissot PRS 200 Chronograph. This outstanding men’s watch is ideal for deep-sea diving with a sturdy contoured round case and matching multi-link bracelet in brushed stainless steel. The unidirectional rotating bezel in brushed stainless steel has engraved markers and a distinctive coin-edge rim. The attractive blue dial has a tachymeter outer dial, three sub-dials, luminous skeleton hands and baton hour markers. Features include an automatic date window at the 4 o’clock hour, 1/10th of a second, small-second and 30-minute registers. 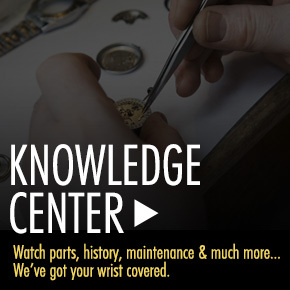 Additional features include a glare proof, scratch resistant sapphire crystal above the dial along with a locking screw-down crown and case back for water-resistance to 200 meters or 660 feet. Premium Swiss-made quartz movement inside provide precise time-keeping accuracy. A locking screw-down crown and case back provide water-resistance to 200 meters or 660 feet. 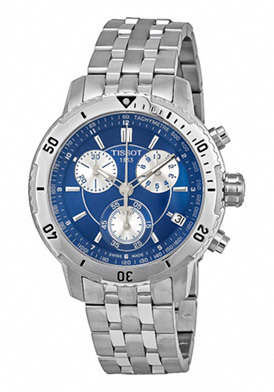 Tissot PRS 200 men’s chronograph is 45mm in diameter and 12mm thick. 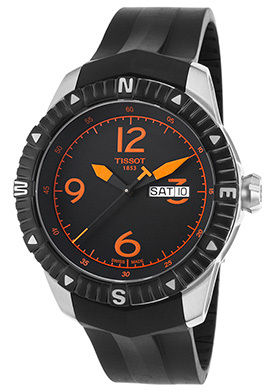 You’re certain to chart the perfect course with the Tissot Sailing T-Touch watch made expressly for yachtsman. This outstanding digital/analog timepiece features the contoured round case in premium grade stainless steel, fully integrated into the striking horizontal link bracelet in brushed stainless steel with attractive black rubber accents. The dark blue ion-plated stainless steel bezel with screened markers surrounds the analog/digital dial with a blue background, red luminous hands and luminous hour markers. The touch sensitive sapphire crystal above the dial lets you access the tide, altimeter, regatta, alarm, speed, chronograph day and date functions. Features include premium Swiss-made quartz movement inside and water-resistance to 100 meters or 330 feet. 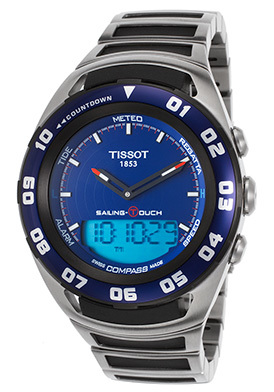 Tissot Sailing T-Touch watch is 45mm in diameter and 15mm thick. Hiking and mountain climbing adventurists are certain to enjoy the precise calculations of the Tissot T-Navigator Automatic watch for men. This bold and masculine timepiece has a round premium grade stainless steel case, presented on a hard-wearing black rubber strap with a convenient deployment clasp closure. The bidirectional rotating compass bezel in black ion-plated stainless steel is ideal for calculating distance. The legible black dial features luminous orange sword hands, baton and Arabic numeral hour markers. A window at the 3 o’clock hour reveals the automatic date and date calendar. The semi-exhibition skeleton case back lets you view the intricate Swiss-made automatic movement inside. Features include a scratch resistant sapphire crystal above the dial, along with water-resistance to 100 meters or 330 feet. Tissot T-Navigator Automatic men’s watch is 44mm in diameter and 14mm thick. Tissot display watch image courtesy of Wiki Commons.